We all know that even a lapped Perfect Powder Measure is bound to spill just a bit of powder, the amount depending on the type of powder. 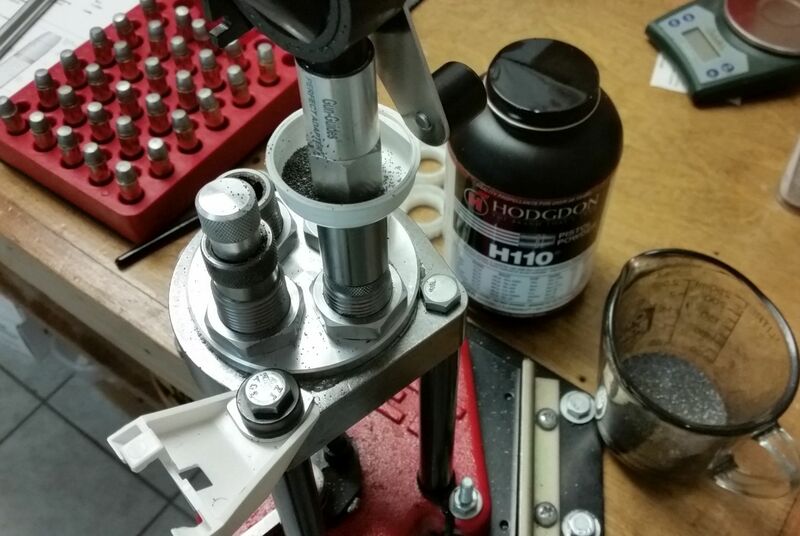 It has never bothered me on the bench mount, but in that, I have started using the PPM with the Gun Guide's Adapter directly on the Powder Through Expander Die or the Lee Short/Long Rifle Charging Die, it does. Plus in either case, I would like to try to recover the spilled powder. As I started to reload yesterday morning, I watch just a few specks of H110 falling onto the white Safety Prime mount and immediately envisioned a tray of similar shape that mounts on the base of the PPM. It would keep your bench or turret head clean and allow the recovery of the powder. It would need to keep clear of the handle on one side and then be able to keep clear of the bullet seating die as well for use with a turret head. Not having a 3D printer, I immediately pressed a mailer tube end cap into service! The powder debris on the turret head is primarily what landed prior to using the catch tray. After installation of the tray, the spill onto the turret head was nil. The spill is negligible and typical. After thirty drops I dumped the spilled powder into the scale pan and it weighed 2.5 grains, less than a tenth of a grain per drop. I sent this to Dennis at Titan, don't know if he would pursue it as a 3D printed item for sale or not. I'm not going to get into the 3D stuff. I might use the other end cap to make another with the hole off center so that more area is available on the spill side of the tray plus I will keep my eye out for any other shaped part that might work. Did you make the hole in it with a drill ? farmerjim wrote: Did you make the hole in it with a drill ? Yeah, a step drill. Just cut real slow speed. I look at the drill bit and get back with the size of hole needed. What's the diameter of the hole? Thanks for the idea. Here's the 3D model of your spill tray.